Blue! Yellow! Green! Red! 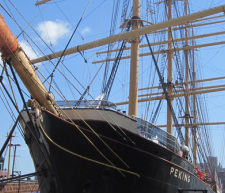 -- Colors filled the air aboard South Street Seaport’s anchored Peking Ship on Saturday, March 19, 2011. 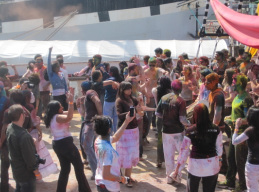 IN Group hosted an event filled with music, colors and excitement as guests celebrated Holi. 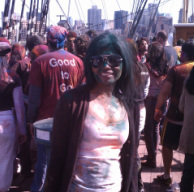 Over 250 people were in attendance for the 4th year of “Rang Barse” on Peking ship. The ship is 377 feet long and docked at the South Street Seaport which is set against the backdrop of Wall Street and the Brooklyn Bridge. During the celebration, South Asian fusion music was provided by DJ Jay Dabhi in addition to traditional Indian dhol players. A special Bollywood-style performance by performed byt both Dhoonya Dance Group and Bollywood Axion. 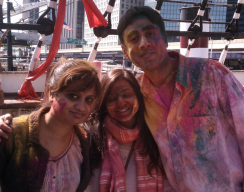 This was definitely a fun and entertaining event that had guests dancing, throwing colors and making new friends! We look forward to celebrating Holi with IN Group next year.